With the London Marathon just under a month away, now is the perfect time to start your tapering period. For those that don’t know, tapering is the process of slowly reducing the frequency and distance of training runs in the build up to race day. Runners do this to allow their muscles time to repair and rest after months of intense training. Typically, you will want to start tapering for your race around three weeks before the event. Some people vary the duration of their tapering period, but if you’re a newbie, three weeks is a great place to start. You’ll want to start the day after your longest run, which should be around 20 miles. For the first time marathon runner, the tapering period can be difficult. Your mind and body will start playing tricks on you, so it’s important that you have a plan and stick to it. Here are five tips to help you get your tapering period right so that you’re in optimum condition for race day. There will be times in the build up to race day where you will question your tapering plan. If it’s your first marathon, you will be double guessing yourself. You might think you’re not physically ready and you should squeeze in one or two more training runs. You might feel the opposite, confident that you’re in great shape and think you can up the intensity. Whilst this one may seem obvious, you can’t relax too much during your tapering period. Even though your body is in a recovery phase, this doesn’t mean you can start pounding junk food or hitting the booze regularly. As you reduce your miles you will find that you have much more time on your hands, so it’s easy to snack. You don’t want to be carrying around excess weight that you’re not used to carrying. Also, as you will be running fewer miles at a slower pace, it can be quite easy to get comfortable and have your form suffer. Keep focus, as it can be hard on these shorter runs as you’re not being tested physically. You can use these as opportunities to prepare yourself mentally, work on your breathing and perfect your stride pattern. When you’re used to training at a certain intensity and distance, then you suddenly start reducing that, it’s mentally tough. You put in weeks of training giving 100% effort and now in the tapering period, you’re not even pushing yourself. You may feel like you’re starting to loose momentum. A great way to combat this is to not change the volume of your runs in your tapering period, just shorten the distance. So if you’re running four times a week in the main bulk of your training, still do the same in your tapering period. Just make sure you adequately cut down the mileage. This helps you to stay in the same routine you’re used to and will pay dividends on race day. We touched upon this lightly earlier but the tapering period is a great time to work on your pacing. By now, you should have a general idea about what pace you’re going to try and keep to in the race. Now is the time to practice it. Try to fit in at least a couple of miles a week in your taper to practice running at your preferred marathon pace. When you step on that start line, you want to know how fast you will be running in the race. Sure, during the race it’s going to fluctuate, but having that benchmark time allows you to measure whether you need to speed up or slow down. Doing pacing work in the build up also gets you into the ‘race’ mindset. When you hit that wall, you’ll thank yourself later. An extra tip, even if you’re only running two miles at marathon pace a week in your taper, you may find it difficult. This is completely normal. You’ve decreased your miles in your taper so this new pace may be a bit of a shock. Just don’t get disheartened and think you’re off track. Think of your body as a fire. To keep that fire burning bright and hot, you need to need to feed it with the right fuel. If you put dampeners on your fire, it’s going to get smaller. You need to be making the right food choices in your taper to prepare your body for peak performance. You’re probably used to consuming numerous calories in the training period and eating everything in sight. This is not the case in a taper. Like we mentioned above, you don’t want to be carrying excess weight on race day. Try replacing some of your carb count with vegetables to lower your calorie intake whilst simultaneous bring on more vitamins. Sleep is another important factor. After doing 8 weeks or so of hard running, your muscles are going to heavily fatigued. Our muscles repair when we sleep, so you need to be getting enough of it. Don’t underestimate what a good night sleep can do for your body! 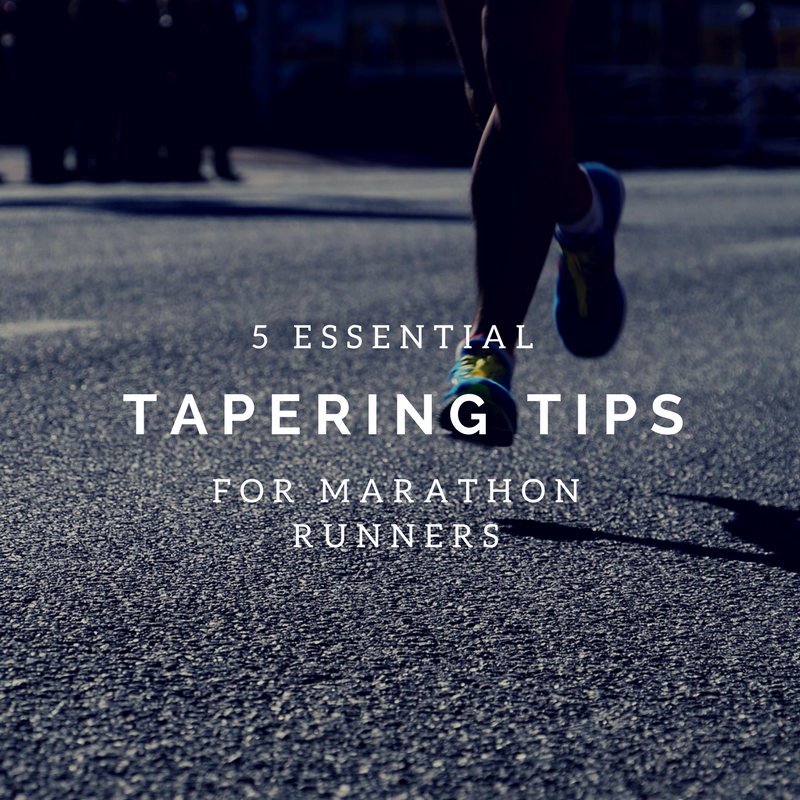 I’m a believer that tapering is the hardest part of preparing to run a marathon. With distance, the results and progression of your training are clear. I can now run 15 miles, 20 miles, the proof is right in front of your eyes. With the tapering period, there is a lot of guesswork involved. It’s subjective in nature so it’s not an exact science. You also don’t know how the period went until after you have finished the race. Looking back, you’ll immediately be able to pick out things that you would have done differently that you believed had an impact on your performance. You’ll make tweaks and changes for next year, but that’s ultimately it. Your next tapering period won’t be until your next big race. Veteran marathon runners tweak and change their tapering plans consistently; there’s always room for improvement. Just enjoy the experience as a whole, you’re going to learn 10 times more about tapering by actually doing it rather than reading about it. Every runner is different so learn from experience and grow as a runner. To all the newbie London Marathon runners, good luck out there and happy tapering! Have you prepared your race day bag? Make sure you don’t forget these essential but easy to forget items!